Racing Club Warwick provided a fitting tribute to Gabby Hayes, crashing home five second-half goals on a day the club came together to honour their long-time supporter. Hayes passed away shortly after Racers’ previous home fixture and players, family and supporters paid tribute to him before the game with a minute’s silence. Luke Church follows up to put Racing Club 2-0 up. Racing Club produced some of the finest football seen at Townsend Meadow for many years but had to wait until the second half before they were well and truly unleashed. The first half had been a fairly even affair possession-wise but it was the home side who were the more threatening. Twice Sean Kavanagh should have opened the scoring after going through one-on-one but his shots grazed the outside of the post on both occasions. Tom Cross saved well down to his right midway through the first half from a deflected Tom Brennan shot as the half ended goalless. Sean Kavanagh, grounded, scores Racing Club's fifth. The second half had barely got under way when a reckless challenge on debutant Josh Cole saw Nuneaton Griff’s Fraser Mullins receive his marching orders. Cole limped off but the injury was to prove far less severe than it first appeared. The resultant free-kick from Martin Slevin was well saved by keeper Gareth Huskins but continued pressure from Warwick paid off on the hour-mark when substitute Luke Church headed on a corner for Kavanagh to nod home. Two minutes later, Church fired home again from close range after Huskins had initially saved a Luke Cole effort. Racing were now rampant and a pinpoint Church cross found Luke Cole whose curling volley nestled just inside the keeper’s left-hand post. Skipper Alex Price then produced a peach of a shot which flew into the top right-hand corner after some slick football from the rampant hosts. Lewis Hudson came on for Racing Club to make his debut after his move from Coventry United and Kavanagh wrapped up the scoring with a confident finish after a neat one-two between Church and Adam Knight. Racing Club boss Scott Easterlow said the victory over Nuneaton Griff was not a given despite their visitors’ lowly league position. 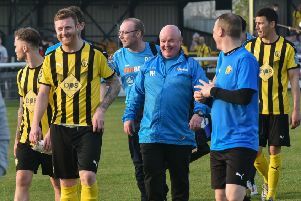 Griff arrived at Townsend Meadow having tasted defeat just once in their previous six games and Easterlow admitted it needed a more patient approach for his side to get their rewards. “It was a game looking at the table that you would expect us to win but that was the first game they have lost under their new manager,” he said. “A hectic first 15 minutes was the only time I felt they might score. “Once we settled into the game we looked comfortable which was pleasing as we changed the shape so it was always a slight worry how the lads would adapt to it but I’m pleased they took it in their stride. “Without being at our best in the first half we still missed two one-on-ones. “I felt we should have gone in at the break at least one up, although we were forcing balls instead of being patient and going route one too often. With 11 goals scored and none conceded in their last three games, Racers go into Saturday’s FA Vase clash at home to Alsager Town in great spirits.